Following a promising year with the LC1 Group 6 prototype, Lancia ramped up the project 1983 with the LC2. It was the first and only Italian car built to Group C regulations. Throughout three years of racing, reliability plagued the Lancia Martini team which was one of the few willing to take on the dominant Porsche 956s. Learning from the 1982 season, Lancia and Cesare Fiorio had to design almost an entirely new car. With Ferrari in Fiat’s pocket, the LC2 got a Ferrari heart and a dramatic closed bodywork. This was in part due to the Group C regulations which stipulated closed coupe bodywork and fuel economy standards. Like the LC1, the LC2 was developed almost entirely by Gianpaulo Dallara and Abarth. To keep pace with Porsche and the 956, a version of Ferrari’s V8 was sourced from the 308 QV. With twin KKK turbochargers, the 3.0-litre engine produced around 850 bhp. Cooling was handled by a front mounted radiator and twin intercoolers beside the engine. It powered the rear wheels through Hewland five-speed manual transaxle. This V8 became the center of the chassis and was rigidly affixed as a stress member of the chassis. Both Dallara and Abarth developed the chassis together under the direction of Cesare Fiorio. Dallara handled fabrication of the aluminum-tub chassis and Kevlar bodywork. The body was similar to the LC1. It had a large front opening that fed both the front radiator and the twin intercoolers. Along with a large rear wing an under body was created to provide ‘ground effects’. Over the three years that Lancia actively raced the LC2, its body slowly evolved. 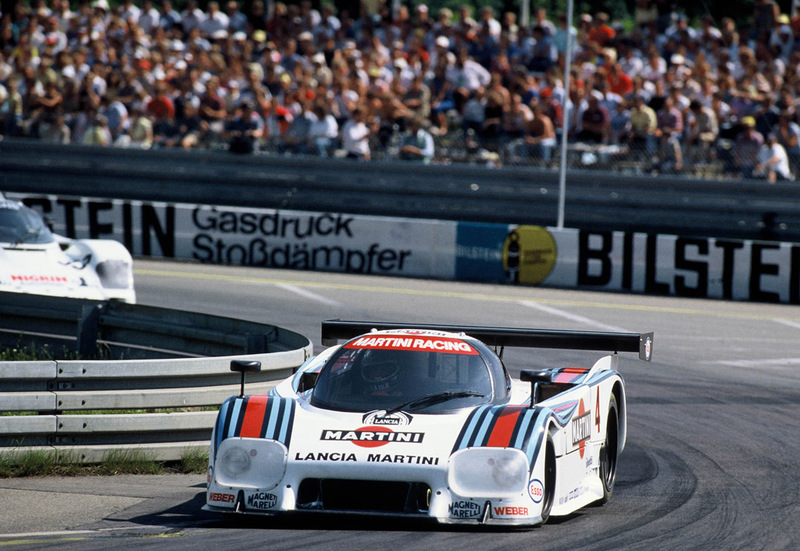 Under the Martini Racing banner, Lancia debuted the LC2 at the 1000 km of Monza and faced the Porsche 956 for the first time. The car posted a promising pole position, but suffered from tire problems for the remainder of the season. The car only won a European Endurance Championship round at Imola with drivers Teo Fabi and Hans Heyer. For 1984, Lancia changed tire suppliers to Dunlop which looked initially promising, placing first at the season opener at Monza. Le Mans also looked promising, with both cars leading the race half way through, but reliability of the gearbox gave the coveted victory away. By 1985, the LC2 project looked fleeting compared the Porsche 956 steamroller. Unfortunately, the results that year did nothing to quell this impression. At Mugello a car placed pole only to have its engine fail. Silverstone, Le Mans and Hockenheimring also ended with retirements. Despite some promising moments, the car only beat Porsche at SPA when the race was cut short out of respect to Stefan Bellof’s fatal crash at Eau Rouge. Only one car was used in the 1986 season and predictably, the car was pulled mid-season for lack of results. At the season opener in Monza the car finished one minute behind the leading Porsche.